Pen-and-ink drawings of a sculpture of Narasimha from Cave III, Badami, a ceiling panel with Shiva and Parvati in the centre and roundels on a pillar, by an Indian draftsman, dated 1853. 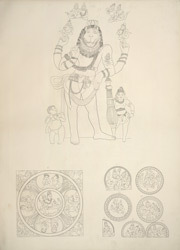 The top drawing depicts the the large figurative panel of Narasimha. the Lion-Man, carved inside the porch of Cave III at Badami. In his incarnation as Narasimha, Vishnu appears as half-mand and half-lion to kill the demon Hiranyakashipu who was not allowing the Hindus to worship Vishnu. The bottom left drawing depicts the medallion carved on the ceiling which contains the figures of Shiva and Parvati. The other medallions containing amorous couples, to the right in the drawing, are carved on the shafts of the columns of the porch. Badami, formerly known as Vatapi, was the capital of the Early Chalukya rulers in the sixth - eighth centuries. The town is situated between two rocky hills of red sandstone that surround an artificial lake. There are two later forts that overlook the town. Around the south fort there are four rock-cut shrines while structural temples dominate the site on the opposite north fort. Cave III was excavated during the reign of the Early Chalukya ruler Pulakeshin I in 578 and it is the finest of the caves of Badami. It has an elaborate sculptural ornamentation and consists of a long porch, a pillared hall (mandapa) and the small square sanctuary.